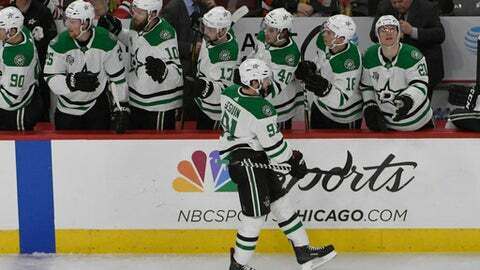 CHICAGO (AP) Tyler Seguin’s scoring touch and Ben Bishop’s fine work in net was enough for the surging Dallas Stars. Seguin scored twice, Bishop made 37 saves and the Stars beat the fading Chicago Blackhawks 4-2 on Thursday night for their fourth straight victory. Tyler Pitlick connected with 4.5 seconds left in the second period and Stephen Johns also scored for the Stars, who strengthened their hold on the top wild card in the Western Conference and remained one point behind third-place St. Louis in the Central Division. ”Greasy,” said Seguin, who ran his team-high total to 28 goals by scoring for the fourth straight game. ”I don’t think it was the best effort by any of us, starting with myself and our line. Dallas jumped on a handful of Chicago mistakes while completing a sweep of the four-game season series. The Stars have outscored their opponents 16-5 during their winning streak. Jonathan Toews and Artem Anisimov scored for Chicago, which lost its fourth straight overall and sixth straight at home for its longest skid at the United Center since losing eight in a row in 2006-07. Anton Forsberg blocked 26 shots. Toews’ 15th goal at 9:07 was the lone score in the first period. After taking Seabrook’s bank pass off the boards, Toews gained a step on defenseman Dan Hamhuis and snapped off a shot from the left circle that ticked off Bishop’s right pad. The captain snapped an 11-game drought with his first goal since he scored twice at Ottawa on Jan. 9. During the span, the veteran center had just three assists. Seguin and Johns scored on consecutive shots 59 seconds apart early in the second to put Dallas ahead 2-1. Capping a quick transition, Seguin streaked down the slot ahead of defenseman Connor Murphy and tipped in Alexander Radulov’s nifty backhand pass at 5:44. After Chicago turned over the puck behind its net, Johns’ screened shot from the left point appeared to hit traffic and sailed past Forsberg. Anisimov’s power-play goal at 12:48 tied it at 2. He batted in the puck from the left side of the net after Seabrook’s shot from the top of the slot went wide and bounded off the back boards. Pitlick put Dallas back ahead in the final seconds of the period. His shot from the right circle beat Forsberg over the right shoulder and landed in the upper-left corner of the net. Chicago coach Joel Quenneville said Forsberg should have stopped Pitlick’s shot – and the chance shouldn’t have materialized in the first place. Tommy Wingels’ point-blank shot for Chicago hit the post 6:12 into the third. Bishop made a handful of close-in saves in the third before Seguin scored into an empty net with 58 seconds left. NOTES: Dallas D Julius Honka left in the second period with an upper-body injury. … Dallas C Martin Hanzal left the ice limping late in the second period after Brett Ritchie’s shot hit him on the inside of the left knee, but he returned for the third. Hanzal played his second game after missing five with a muscle strain in lower body. … Blackhawks G Corey Crawford continues to skate on his own, but Quenneville still has no timetable for his return. Crawford has missed 19 straight games with an upper-body injury. … Chicago D Jan Rutta sat out with an undisclosed injury and is day to day. Blackhawks: At Minnesota on Saturday night to start a three-game trip.